Star Analyzer 200 is a 200 lines per millimeter diffraction grating filter created by Paton Hawksley to let amateur astronomers analyze the spectrum of several objects, such as stars, planets and planetary nebulae. It can be used to photograph the spectrum using many cameras like cooled CCD camera, planetary camera or DSLR camera. The Sar Analyzer is a filter provided with a 200 lines per millimeter grating, able to filter and deflect the light, creating an emission line called spectrum, with different color and wavelength. The spectrum is able to provide all the information of the temperature and composition of any celestial object. Each celestial object is composed of multiple types of gases and solids, these can be analyzed and separated by material, andthe the spectrum can be examined. The Star Analyzer filter consists of a grating to 200 lines per millimeter is possible to observe or photograph with extreme precision and sharpness, three different types of spectrums. Emission spectrum: spectroscopy analyzes the radiation emitted from an celestial object, and a spectrum is composed by a series of lines with different colors on a black background. Each chemical element in atomic state produces its own spectrum line, different from everyone else, that allows its identification. The number of rows and their wavelength (each corresponding to a color) depends on the type of element. 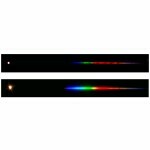 Absorption spectrum: when the light pass through a gas or another substance, observing the spectrum we may notice the presence of some dark lines on a black background. These are caused by the monochromatic radiation absorbed by the gas itself. Continuous spectrum: when on the spectrum are visible all the colors of the visible light, for example the spectrum of our Sun. - Optimised for the small CCD sensors found in popular webcams, video and astro cameras. Star Analyser is available in 2 versions: in the first part of this article you will read what version to choose. More, in the second part of the article you will read how to correctly set the distance from the Star Analyser to the camera sensor in order to record the spectrum. The tolerances in spectroscopy with the Star Analyser are very forgiving so the first thing to know is not to worry about getting your setup exactly right.